I've watched Doctor Who from the beginning. We've had thoughtful Doctors, zany Doctors, ebullient Doctors and charming Doctors, but this Doctor seems angry and offensive and even, inexplicably, to dislike the human race. There's no light and shade in his character, the humour and compassion have been lost. I keep wanting to say, "Who are you and what have you done with the Doctor?" Sadly, until he regenerates again, I shan't be watching. RT's Patrick Mulkern responds: "I'm hugely enjoying Peter Capaldi's more astringent portrayal of the Time Lord, and the Doctor will never lose his aftinity for the human race. If you stop watching now, you'll miss out on some cracking episodes." Our current online poll (radiotimes.com/capaldipoll), in which more than 14,000 readers have voted, reveals that the 12th Doctor is proving popular (below). A BBC spokesperson replies: "For many years, the first two live shows of Strictly have been scheduled on Friday and Saturday evenings. It's a good way of getting through so many dances in the first week, before anyone's eliminated. For Doctor Who, we knew the slot after Strictly on Saturdays would work well for its audience, as it did for Atlantis and Merlin. These slots don't suit very young children, who represent only a small proportion of viewers for these series, but with PVRs and iPlayer, it's easier than ever to catch up at a time that suits individual families. "The BBC receives details of other channels' schedules close to transmission but this is the first year The X Factor aired at 9pm on a Friday, so it wasn't something the BBC could have predicted." Is Peter Capaldi a good Doctor? APA 6th ed. : (2014-10-11). Who's Watching Who?. Radio Times p. 167. MLA 7th ed. : "Who's Watching Who?." 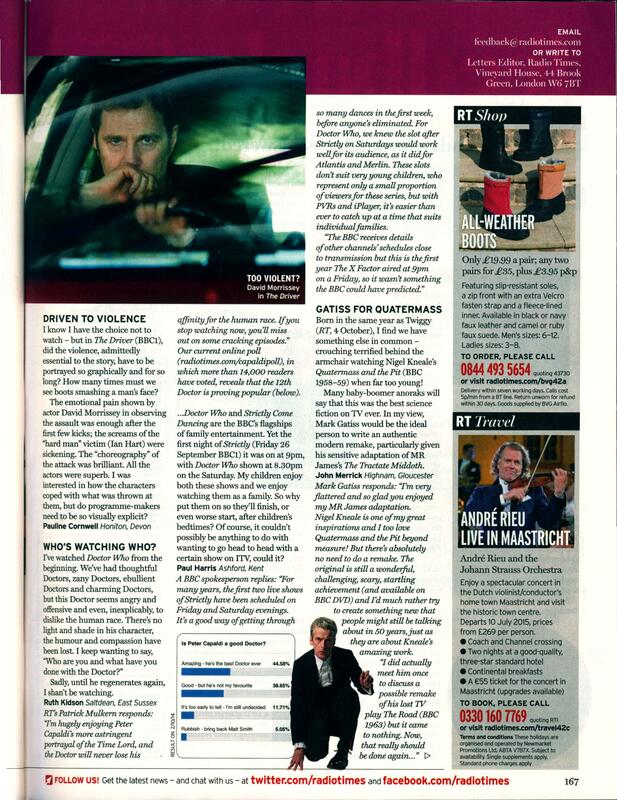 Radio Times [add city] 2014-10-11, 167. Print. Turabian: "Who's Watching Who?." Radio Times, 2014-10-11, section, 167 edition. This page was last modified on 11 October 2016, at 05:46.